and will deter bug infestations. 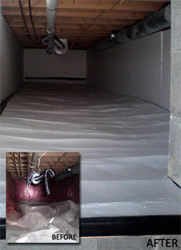 Crawl spaces often provide the ideal environment for pest infestations. Due to access constraints, it is difficult to do a thorough and routine visual inspection in crawl spaces. Most basement crawl spaces have gaps in their construction and are cold and damp. All of these conditions provide the opportunity for pests to enter and thrive in your home. Columbus Pest Control can provide pest control treatments for your basement crawl space while eliminating the conditions that attract pests. Our insulation technique will diminish the moisture, mold, and mildew while improving the energy efficiency in your home. We also apply insulation in a manner that still allows for good visual inspection of crawl space areas for termites and other pests. After an initial inspection, the Columbus Pest Control specialists will determine the type of pest(s) that are present and the best pest control treatment. We will also recommend changes that will affect the air movement and humidity level in the crawl space. This may include the addition of fans, heat, return ducts and specialized insulation that can be applied to the walls and ground to equalize the temperature and moisture levels in the basement crawl space. 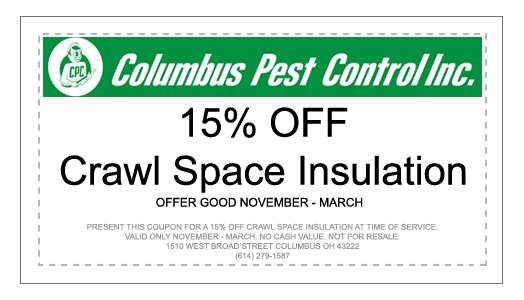 Call Columbus Pest Control for the best pest control solution for your basement crawl space.